As the second DVD in a new series, it is impossible to know how the series will shape up but, if this DVD is an fair indication, this will be a compelling series that explores the battlefields of the Western Front. DESCRIPTION: As the second DVD in a new series, it is impossible to know how the series will shape up but, if this DVD is an fair indication, this will be a compelling series that explores the battlefields of the Western Front. The material in this DVD comes as close to presenting the full horror of trench warfare, short of directly experiencing it. The account covers what is a very complex military action at Ypres and at Passchendaele. Much of the previous coverage of the European campaigns of WWI have accepted the inaccurate view that it was a succession of disasters perpetrated by out-of-touch generals who were happy to thrown millions of young lives away. This DVD gives a realistic account of the planning and execution of two significant battles that were perhaps more accurately campaigns because they involved planned action over a period of months. 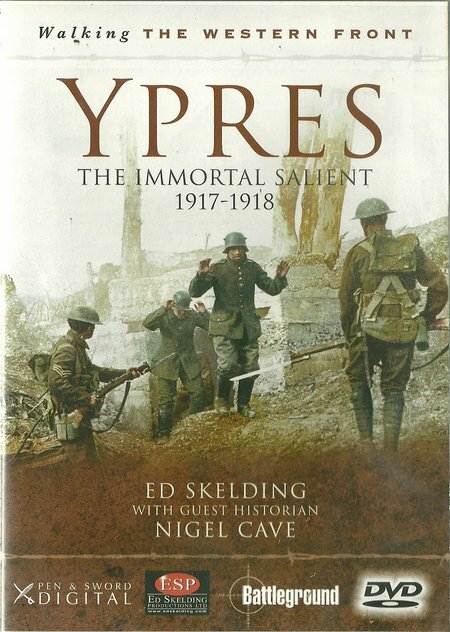 Yres was one of the most significant British victories of the Great War and required the efforts of mining teams over a period of many months. These teams worked in very difficult and dangerous conditions as miners, but to this was added the dangers of counter-mining by German engineers. A subterranean battle that is difficult to imagin, always vulnerable to flooding or collapse of tunnels as the engineers worked, equally vulnerable to a fatal explosion if a counter-mining team was able to intercept the tunnel and explode a mine next to it, or where fighting teams broke through the tunnel wall to kill the miners. The legacy continues because not all mines were detonated. The surviving unexploded mines are still there today almost a hundred years later, although one mine was to explode during a thunderstorm. At the end of WWI the Ypres mines were just some of a number of mines from both sides that were left. It was considered too dangerous to attempt to remove the explosive and, as the years went by, this danger increased. A lightning strike on the command wires, always an added risk during the War, is a very real threat to communities living close to the sites and their proximity makes it impossible to attempt disposal by controlled explosion. The heavily defended German positions were taken and there was point to the battle that justified, in military terms, the cost in lives. Passchendaele was a different situation in that it created the popular memory of WWI trench warfare. As the series of battles, that spanned a period from July to November 1917, progressed, the heavy and continuing rain turned the battlefield into a sea of mud that drowned thousands. This created an image of senseless slaughter, where a break through by either side was denied by the ground conditions. It was very difficult to recover all of the dead from Western Front battlegrounds but particularly at Passchendaele where the battlefield is a huge war grave.